Max Planck Institute, Martinsried, Germany. This demonstration shows electron microscope tomography of a human immune system cell in contact with target cell. Vesicles containing serine proteases are transported to the cell membrane along microtubles to kill the target cell. The demonstration shows the tomography map, a segmentation of the tomography, a high resolution microtubule map, and a microtubule atomic model. The demonstration illustrates use of several Chimera tools: map display, single plane display, placing markers on maps, segmentation display, tracing paths, fitting maps in other maps, fitting models in maps, multimeric atomic model display, display of inter-molecular atomic contacts. Step by step notes for demonstrating visualization form cellular scale to atomic scale. Resize Chimera window to use 2/3 of screen. Open map ctl.nc (ctl = cytotoxic T lymphocyte). Press Show button on volume viewer dialog. Switch surface display to solid. 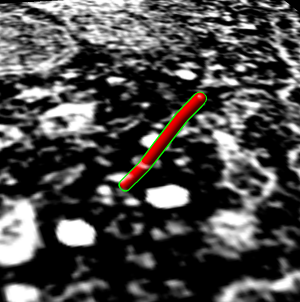 Tomography typically viewed with volumetric (solid) rendering. Adjust transfer function. Lower threshold to 110. Note map size (2048, 2048, 76) and subsampling every 8th voxel along each axis. Tilt map to show thickness. Start volume planes tool (Tools / Volume Data menu). Obtained from experimental features web page. Place slider under main window, resize to equal width. Adjust transfer function. Middle node to 150, full brightness. Adjustment needed since only one plane being displayed. Press Play button on volume planes dialog. Adjust step size to 4 to flip through planes quickly. Point out two cells, boundary between them, lytic granules (bright white blobs). Explain granules are delivered to target cell to initiate apoptosis, transported along microtubules. Open segmentation made in IMOD, ctl.imod. Reorient view from t-cell side, looking down 45 degrees, zoom in. Blue lytic granules, red microtubules, yellow centriole organized microtubules, green golgi, white cell boundary. Change color of cell boundary so it is different from map. Select it with mouse. Shortcut co to color it orange. Note Chimera cannot create these segmentations and has few capabilities to use them, other than looking at them. Components can be hidden. Select golgi and hide with hs, reshow with sf. Microtubules are all one component in IMOD segmentation so they cannot be hidden or recolored separately. Splitting by connectedness could be added in the future. Chimera has tool to measure volume within surfaces. Will not work on lytic granules because of open ends at top and bottom. Again could be made to compute volume even with open ends. Just starting to develop Chimera tomography tools. Hide segmentation using Model Panel. Crop using volume subregion selection central box containing centriole and golgi in order to flip through planes quickly at full resolution. Find favorite microtubule, close to perpendicular to z planes. In plane 20 it is above brightest spot near golgi. Zoom in close and center in window. Flip through planes 20 - 62 showing its path. Start at plane 20 and place marker using volume path tracer. Turn on drop markers on empty space. Resize marker to 50A radius (10nm diameter versus tubule 25nm diameter). Set center of rotation with cr or Actions / Set Pivot. Tilt plane to show that marker is on the plane, then tilt back to face on. Place 3 more markers at on higher planes up to about plane 62. Drag select all and change link color to red, radius to 50. Tilt to about 45 degrees and flip through planes. Show zone around trace, 200A (20nm) radius. Mesh. Turn on square mesh or have it saved as default volume dialog setting. Compare to single particle microtubule map. Open microtubule.mrc. 8A map blurred with 10A Gaussian convolution because we just want to see tubulin organization. Map opens far out of view. Center in view with Cm. Color cyan, lower contour level to about 120, surface style. Close marker set in path tracer dialog (File / Close marker set), turn off marker mouse mode and close dialog. Hide ctl.nc with model panel. Zoom in and orient vertically microtubule.mrc. Explain architecture of 13 lengthwise protofilaments, each made of alpha and beta tubulin monomers (one per bulge) alternating. Fit microtubule map in tomography map. Explain that this is just to illustrate fitting tool. Since protofilaments and monomers not visible in tomography we won't get any filament orientation info. Show ctl.nc, orient vertically, freeze it, and hand align microtubule map in middle of ctl microtubule, unfreeze, and show from different angles. Show fit map in map tool. Menu Tools / Volume Data. Choose microtubule as first map. Set microtubule step to 2 to make fit very fast -- does not effect observed map features. Press Fit. Sometimes map is thrown far away (is using data outside zone). If so, try again near center of ctl microtubule. Note correlation of 0.02, essentially 0 because only data within microtubule contour level used. So correlation measures protofilament and monomer structure. Turn off "use only data above contour level" and press Correlation button to show slightly higher correlation 0.13 due to tomography having hole in middle. Now look at higher resolution. Fit tubulin atomic model in map. This will show some features for working with single particle maps. Opens far out of view, center with Cm. Hide microtubule.mrc if it block view of 1jff. Color alpha and beta tubulin differently, rc (rainbow chain). Switch to ribbon display rr, hide atoms ha. Show microtubule.mrc as mesh, step size 1. Hand position dimer in map, freezing other models with model panel. Select all atoms sa, and focus fo, rotate to show front and back of hand fit. Use fit model in map, menu Tools / Volume Data, press Fit. Note that model moved to local maximum average density at atom positions. Have undo/redo move on toolbar and show original and final position. Note average map value. Should be 145.5 for correct orientation with longest diagonal helix on outer side of tubule. That agrees with published fit. Get 144.3 for upside down orientation. Reorient and try again to get 145.5 -- look for long helix on outside. Note that average map value has no absolute meaning since map is not normalized, but can be used compare alternate orientations. Note number of atoms outside displayed contour is another measure of quality of fit. Clear selection for simpler view and rotate to show inside and outside of tubule. Now we'll look at atomic contacts between protofilaments. Color cyan microtubule mesh transparent gray roughly (.7,.7.,.7,.7) to contrast with cyan multiscale surface. Reset clip planes and zoom "va" and center of rotation "cr". Show original dimer as ribbon. Press multiscale select chains with loaded atoms, then press style Show... / Ribbon. Explain that blue and yellow surfaces depict other alpha and beta tubulin monomers. They are low resolution surface calculated from 1jff PDB model. Select yellow monomer, then all copies, then change resolution to 3A. Explain that Chimera placed them using symmetry matrices to put into 1jff PDB file (with text editor). Symmetry matrices were from known symmetry of map (40.6A tubulin monomer spacing, one helical turn of tubulin monomers rises 3 monomers). Now look at contacts between adjacent protofilaments. Look at alpha-alpha and beta-beta contacts. Zoom in on ribbon and non-seam protofilament neighbor. Select one residue of ribbon and up-arrow twice to select full dimer. Shift ctrl click to add adjacent alpha+beta monomer surfaces to selection. Hide other chains using multiscale Hide button, show selected as ribbon. Make ribbons match surface colors with multiscale color Ribbons button. 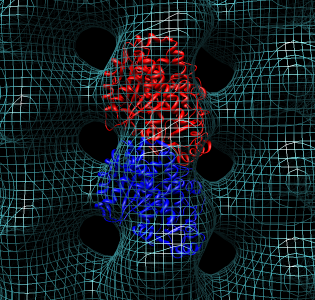 Reselect full ribbon dimer, switch on "load atoms" in multiscale and press Contacts button. Press up-arrow to select whole residues, and display atoms "da", show as sticks "st". Zoom in on one set of contacts and place mouse over a few residues to get pop-up balloons identifying residue numbers. Chimera has many more capabilities for studying atomic models. For example it could compute a sequence alignment of alpha and beta tubulin and a corresponding structure alignment. We are developing Chimera to provide visualization and basic interactive analysis for length scales from molecules to cells. Tomography capabilities are currently much more limited than atomic model capabilities. Volume plane display and IMOD segmentation display are new and not yet part of the standard Chimera distribution. Available as plugins that can be downloaded from the Chimera Experimental Features web page. Show this web page. Tomography NetCDF file. The original tomography MRC map header claims it is signed 8-bit data. It is in fact 8-bit unsigned. Map reinterpretted as unsigned and inverted (0 becomes 255, 255 becomes 0) was saved in a NetCDF file ctl.nc. That file also contains subsampled copies of the map with step size 2 and 4. Those were created with the Chimera VolumeProcessing/download.py script, opened as precomputed subsamples with volume viewer and then saved in the netcdf format. The subsamples allow quick display of the full map without having to read full map (~300 Mbytes) from disk. Fitting with symmetry. Plugin allows fitting one copy of a molecule (e.g. tubulin dimer) by hand or with local optimization while other symmetric copies automatically update their positions. Good for seeing clashes. Clash detection. Have atomic clash detection that can be used during fitting. Can show lines between molecule being fit and neighbors when atoms are close. Real-time update is currently (1.2382) slow even for two tubulin dimers (~6000 atoms x 2) because calculation is in Python. 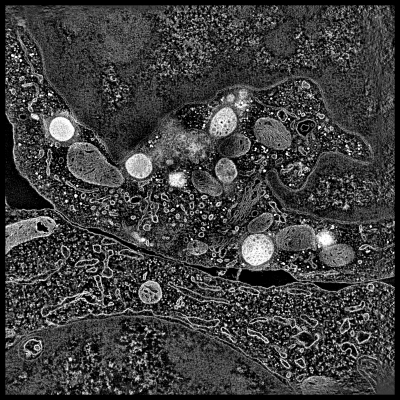 Cellular tomography. 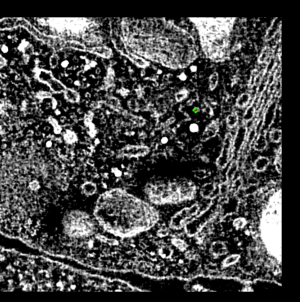 EM tomography (EMDB 1273) of stained plastic fixed human cytotoxic T lymphocyte in contact with a target cell. Examined transport of lytic granules to synapse along microtubules. Microtuble density map. Microtubule single particle cryoEM construction to 8A resolution. (Obtained from KH Downing, not in EMDB as of May 2007). Publication proposes that single particle reconstruction is better than helical reconstruction for this data. Rises 3 monomer units in one turn in left-handed helix. This is 1.5 dimers and implies that the filament has a seam -- ie is not strictly helically symmetric unless alpha and beta monomers are considered identical. 13 protofilaments parallel the microtubule axis. At alpha and beta tubulin have 41% sequence identity and are essentially indistinguishable at 8A resolution. Microtububule is about 25 nm in diameter. Symmetry: z-translation 40.6 A monomer to monomer, rotation by angle 360/13 (~= 27.7 degrees) and translation by 3*40.6/13 (~= 9.37 A). I convolved 8A map with 10A Gaussian for simpler presentation. Li H, DeRosier DJ, Nicholson WV, Nogales E, Downing KH. 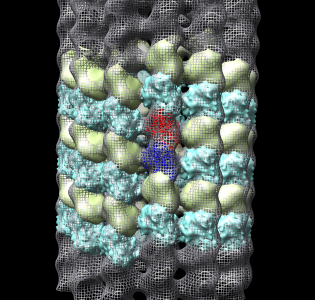 Microtubule structure at 8 A resolution. 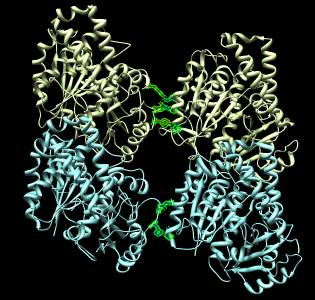 Tubulin atomic model. 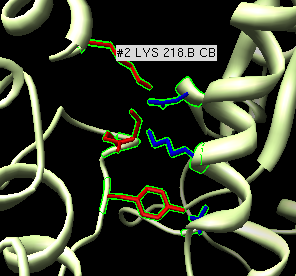 Atomic model of alpha and beta tubulin (PDB 1jff) at 3.5A obtained by electron crystallography of 2-D zinc-induced tubulin sheets. One GTP, one GDP, and one taxol ligand. Protofilaments are anti-parallel one another, unlike microtubule organization. Lowe J, Li H, Downing KH, Nogales E.
Refined structure of alpha beta-tubulin at 3.5 A resolution. J Mol Biol. 2001 Nov 9;313(5):1045-57.